In this tutorial, we will show you how to completely migrate your Odoo installation, from one server to another. In this tutorial, an Ubuntu 16.04 server is used as both source and destination server. The migration is also possible between different Linux distributions. If this is the case, you can use one of our Linux Host Support Services, and simply ask our expert Linux admins to do the migration for you. First, we will need a backup of your PostgreSQL database on your source server. Where “db_name” is the name of the database you need to export and “db_backup.sql” will be the name of the exported database. Alternatively, if you don’t want to export your database through the command line interface, you can use some web-based GUI administration tools like phpPgAdmin or Adminer. where “your-odoo-domain” is the name of your actual domain or your server IP address. If SSH listens on a different port on the destination server, change the ssh port number accordingly. and edit the path for the addons_path if necessary. Again, you can use the alternative tools we have mentioned before to do this, or you can directly export it from your browser using the Odoo Database Manager. With this, the migration of your Odoo should be completed. You can also try to open your Odoo inside your browser and test if everything is working properly. Congratulations! If you are one of our Linux Host Support customers, you don’t have to do any of this, simply ask our admins, sit back and relax. 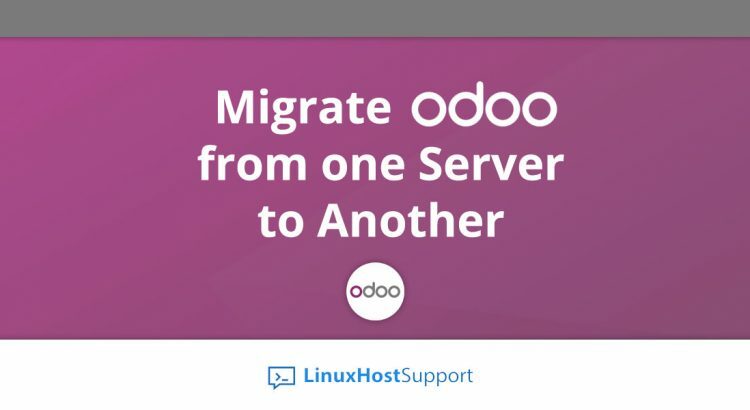 Our admins will migrate your Odoo from one server to another for you immediately. I would like to know if you must include in your backup file the filestore related to this data base. If you backup the database through the Odoo Database Manager, the filestore is included in the backup file, otherwise you need to backup the filestore manually. Where do you find this file store?